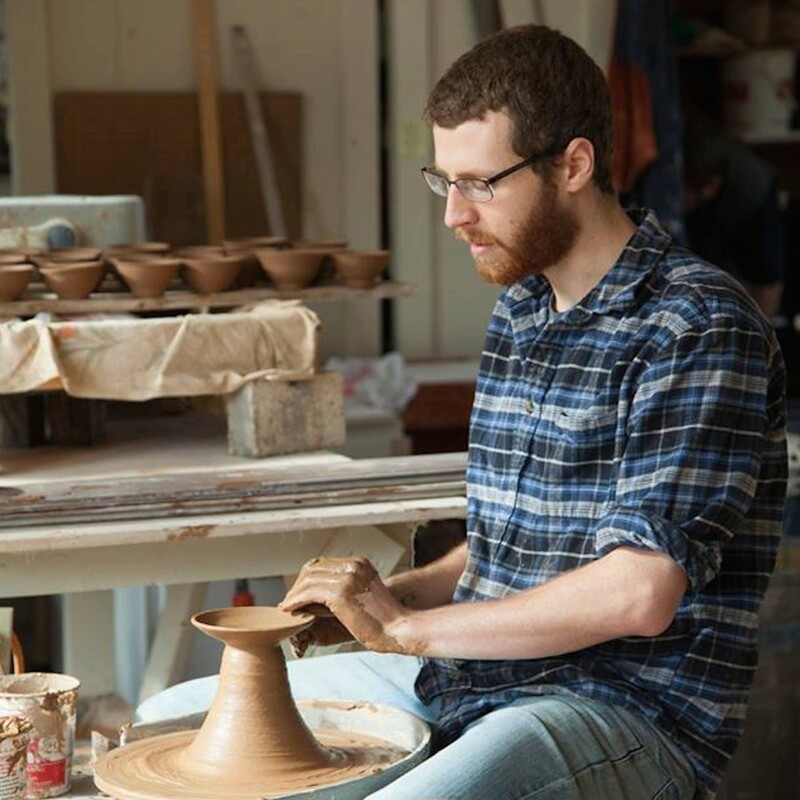 Mitch Iburg is a ceramic artist living and working in the USA. By investigating the local clay deposits, mineral resources, and geological expressions inherent to specific regions, he seeks to create work which combines the physiological substance and emotional characteristics of place to form an expression of its terroir. Through this work, he aims to honour the natural world and its enduring expressions, celebrating our inherent search for meaning through a dialogue with place and time. I maintain a complicated relationship with historical works and traditions. While I strive to make original artwork that is reflective of my own environment and current experiences, I am still deeply fascinated by objects of the past and the methods used to create them. Within the traditions of vessel making it can be difficult to avoid directly referencing these objects because of the expansive and comprehensive history of humankind’s relationship to clay. Rather than trying to rebel against what has been done throughout history, I explore the process of re-envisioning time-endured forms through a personal lens. For instance, my vessel work achieves this by investigating the relationship between coil construction methods and the geological processes through which sediments are deposited in layers. I look at how both reveal the specific conditions of the material at the time of formation, as well as how movement and alteration of these layers reveals energy, movement, and a sense of passing time. Actively rebelling from the larger field has never been a necessity for the development of my own identity. I find myself naturally choosing avenues and techniques that make sense for my ideas, and rejecting those practices that conflict or complicate. Using one’s own work is the ultimate means of understanding function. I enjoy having my own work in the kitchen, alongside the work of my peers and mentors for this purpose. Yes. I see this taking place at a growing rate as more artists are developing new ways to change the dining experience. In its purest form this experience is a form of interactive art. The ability for a meal to convey an idea, experience, memory, or emotion is strengthened by a chef’s awareness of every detail – the plating, table, environment, light, etc. I see chefs worldwide taking a great interest in serving a profound experience rather than simply serving a meal. As this interest continues to grow it will bring about greater awareness of the value of handmade tableware as part of this experience. I often refer to my vessel-based work as having a strong sense of topography. For the Steinbeisser dinner at the Villa Montalvo in Saratoga, California, I wanted to create a body of work which explored this idea within the context of the region’s local mountain ranges. This series gave me the opportunity to translate a vocabulary of topographical features such as peaks, valleys, fault-lines, and plateaus into ceramic form. The work challenged how one would envision traditional tableware, which commonly features the primary plating space in the center of the dish. With this series of mountain plates, building the elevated ridges in the center provided for an opportunity to push this idea of conventional plating. All my work is made from clays I harvest directly from the landscape. I go to great lengths to locate, study, and use clays and minerals that I feel are most reflective of their place of origin, even if it means spending a day hauling the clay from the mountainside in five gallon buckets. Recently I moved to Saint Paul, Minnesota after living and working in northern California for 3 years. The change from a rural to an urban environment has both challenged my practice and opened doors to new materials and modes of working. I am currently pursuing multiple new bodies of work which address different ideas related to local mineral resources and their limitations. Opening my practice to incorporate utilitarian, sculpture, and vessel traditions has allowed me to uninhibitedly move along the spectrum between works that are focused on conveying artistic intent and those purely concerned with reflecting a sensitivity to material. Growth: The potential for the smallest idea to expand and develop into something much larger. My favorite meals are often cooked in an improvisational style. I am always moved by the ability for a home-cooked meal that is unplanned, underprepared, and often painfully simple to provide complete joy and satisfaction. Through new approaches to material and techniques I hope to help expand the practice of place-based making. There is a growing interest in individuals sourcing their own materials, and I am excited to see the effect it will have on the larger community. Erica Iman’s Landscape Plates, Jasmin Matzakow’s Burnt Wood Plates, and Joo Hyung Park’s Moment Plates.